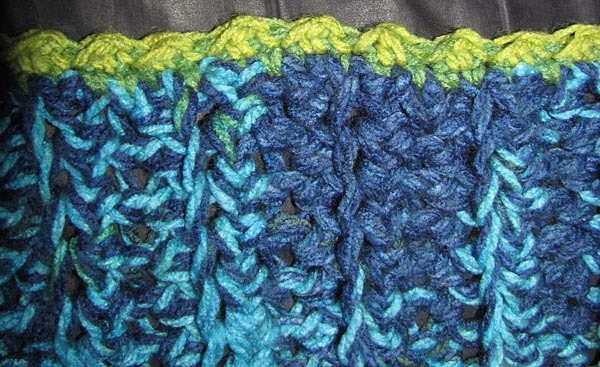 This crochet video tutorial covers the FHDC, Foundation Half Double Crochet stitch which is used as the foundation row in several patterns on HookersDontBite.com. Monday the snow did me wrong. After a winter of hating the snow and fighting against it, I finally embraced it. Over a foot was on the way. School and work were sure to be closed. I looked forward to it. And then… it didn’t show up. 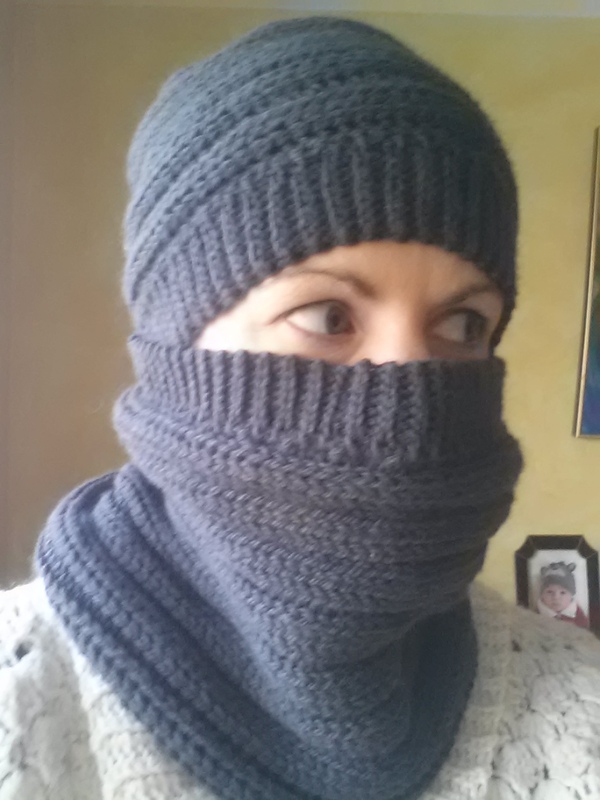 In anticipation, I made a matching cowl to No More Snow! a hat. 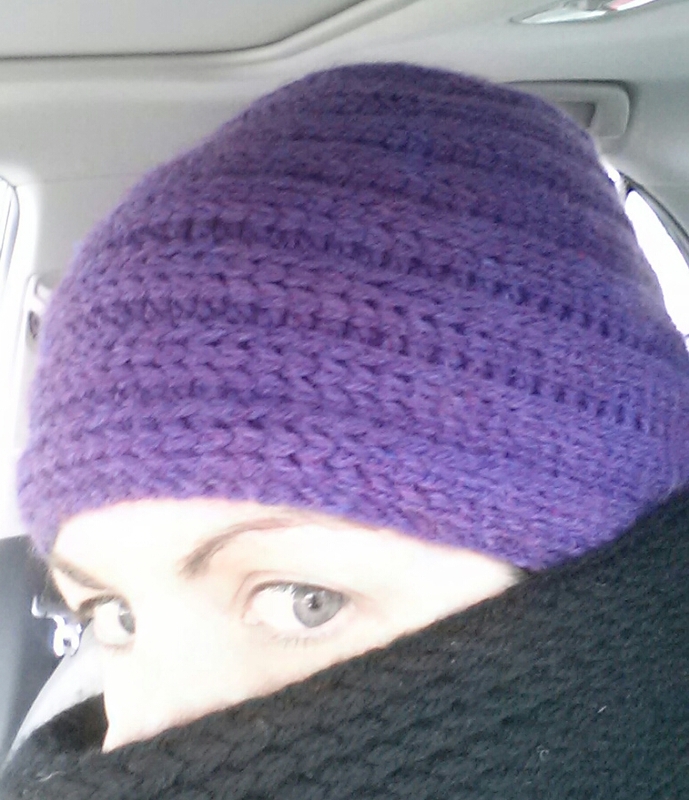 While the snow was a no show, single digits did make a comeback and this cowl did get play this week. Similar to Spareribs, but a little smaller with ribbed edging that lets it be pulled over your nose or mouth, Snow No? will keep you super toasty against the brutal winds and ridiculous temperatures. BLO: Work in the Back Loop Only. BBL: Work in the Back Back Loop only. This is the loop BEHIND the back loop. 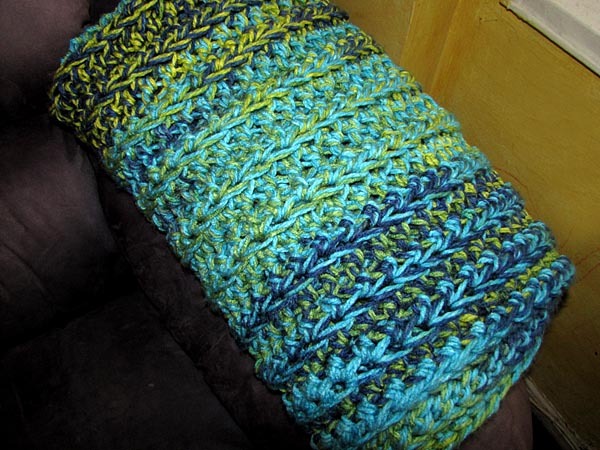 RSC: Raised Single Crochet (special stitch). After using this stitch in the Fritillary Scarf, I did some research to see if there was an official name for this stitch. While I found the stitch mentioned in a few places, I did not see it named anywhere else, so I’ve used the name from the Fritillary Scarf (if it was in American terms). This is similar to a back post stitch. Insert hook from back to front, under top two loops of stitch, then from front to back, under top two loops of next stitch. Hook will be around the post. YO, pull up a loop, YO, pull through both loops on hook. 3 – Your hook will now be around the post. Now YO, pull up a loop. 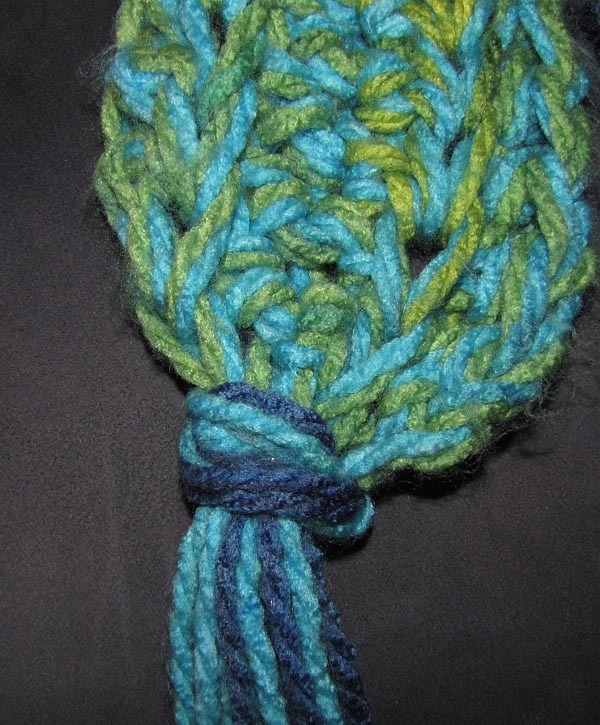 RHDC: Raised Half Double Crochet (special stitch). 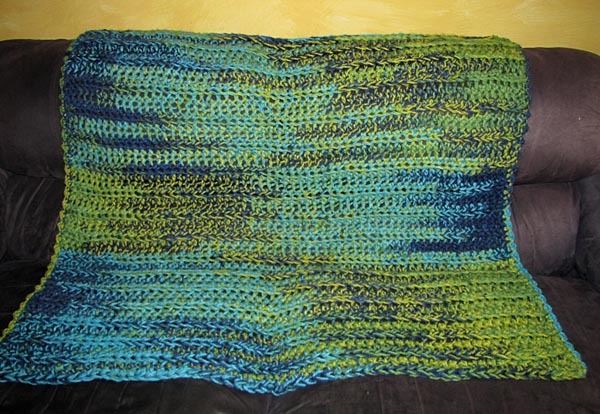 Similar to the Raised Single Crochet, but this is the Half Double Crochet version. YO, insert hook from back to front, under top two loops of stitch, then from front to back, under top two loops of next stitch. Hook will be around the post. YO, pull up a loop, YO, pull through all loops on hook. Video tutorials for the special stitches used in this pattern can now be found on the Crochet Video Tutorial page. The body of the cowl is worked in the round. You will be joining at the end of each round. Do not turn at the end of the round. Do not finish off. The body of the cowl is done. Now for the edging. You will be turning at the end of each row. 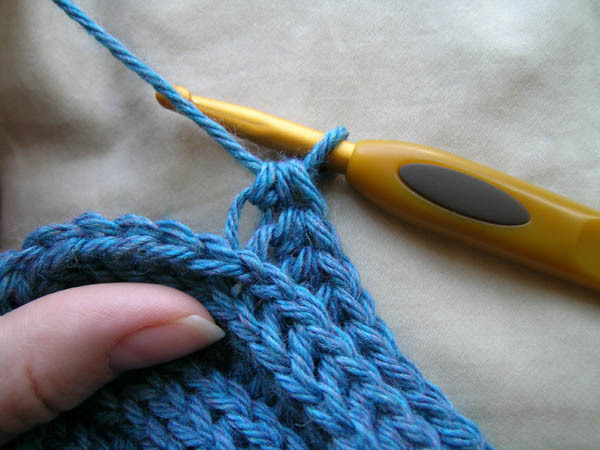 You’ll want to use something to pick up the first and last stitches of each row. 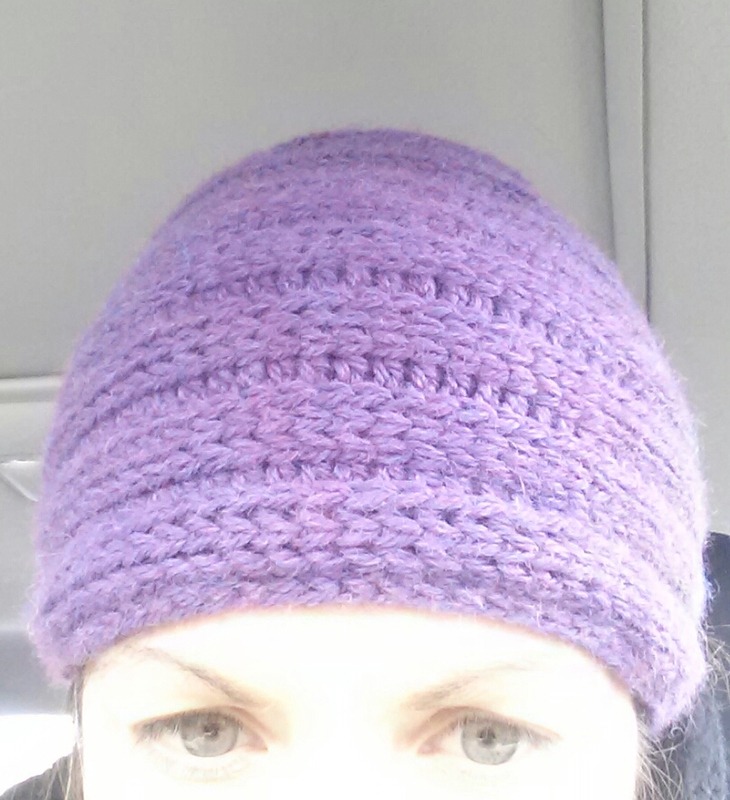 I used the eyehole side of a yarn needle. For the final row that connects the two sides, hold the two wrong sides together, turn. SS through both sides of work, BLO on side facing you, FLO on other side, FO. Now you’ll work the other side of the ribbing. Please note this pattern is for personal use only. Please do not sell finished items from this pattern. While I’m a big fan of the infinity scarf worn doubled, I love the feel of this shorter, wider shape. 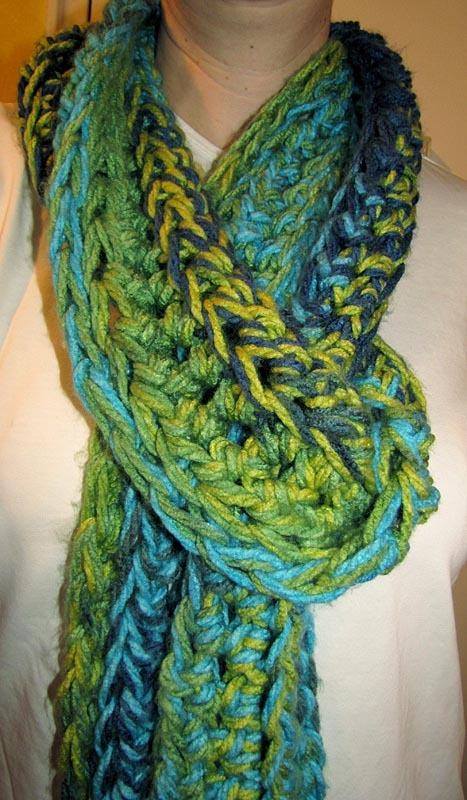 It’s a fun, warm hug of yarn around your neck! 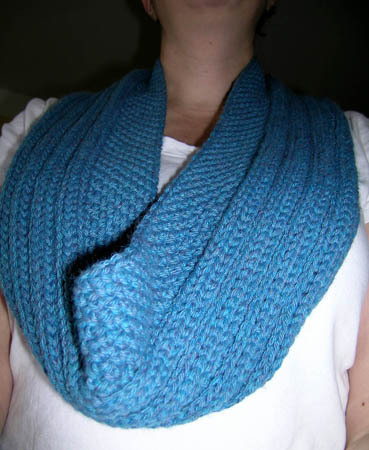 Spareribs is the perfect cowl to take on this nasty winter. It matches Worm on a Hook and No More Snow! 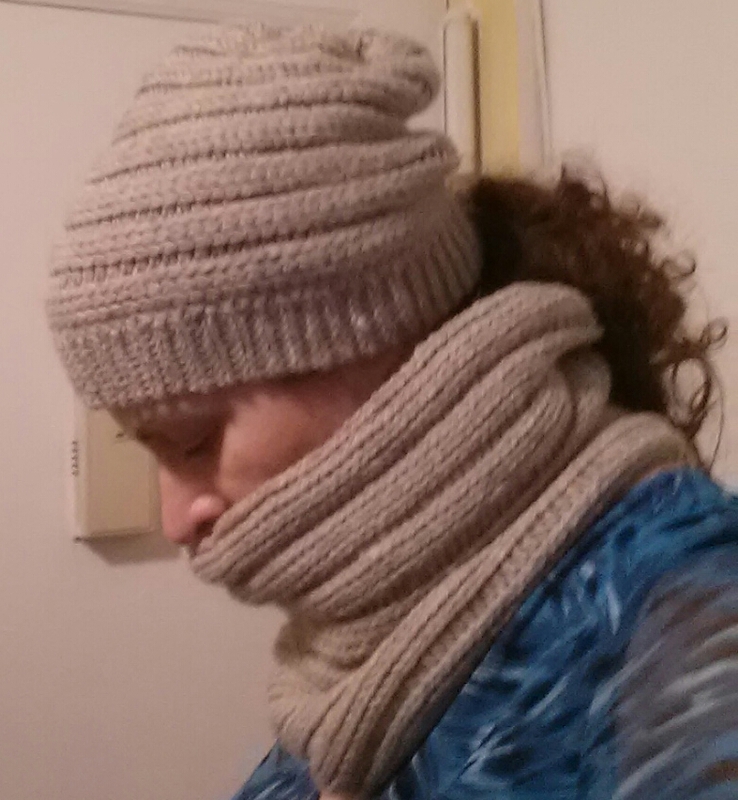 a hat, Spareribs is inspired by several similar looking knit patterns: Jane Richmond’s Welted Cowl, Churchmouse Yarns and Teas’ Welted Cowl & Infinity Loop, and of course Wurm done as a cowl. 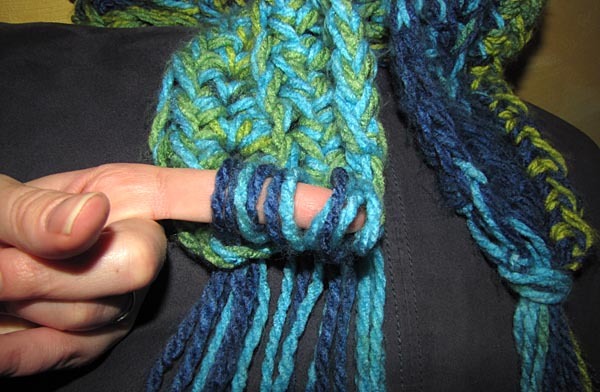 If you’re neck is in need of a warm yarn hug, give it a shot. FO and weave in the ends. Steam block to relax the yarn. 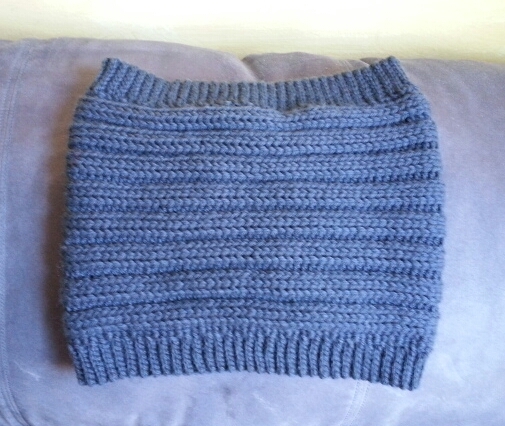 This cowl done in Paton’s Classic Wool was CRAZY stiff before blocking. Paton’s Classic Wool also really softens up when you wet block it, so if steaming is still too stiff for you, wet block it. It cannot possibly be snowing again. But it is. 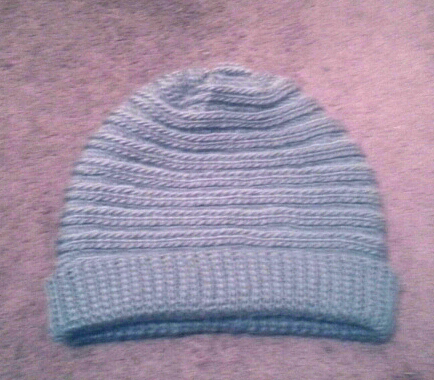 To vent my frustration I made another hat. A cross between Big Worm and Worm on a Hook, No More Snow! is a little larger than Worm on a Hook without the taper rows and with a smaller slip stitch ribbed edge than Big Worm. No More Snow! probably ended up to be the closest of the three hat patterns to Wurm. 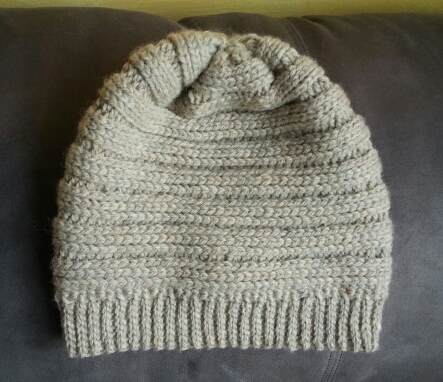 Pattern is written for an adult size hat. Notes are included to adjust for child size hat. The body of the hat is worked in the round. You will be joining at the end of each round. Do not turn at the end of the round. 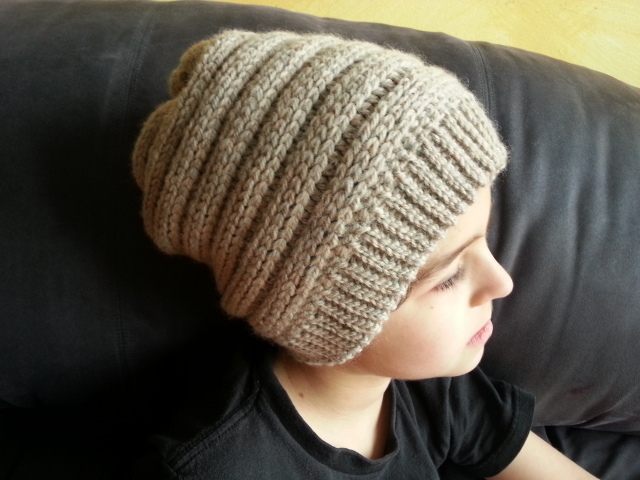 For a Child size hat, start with a foundation row of 78 stitches. 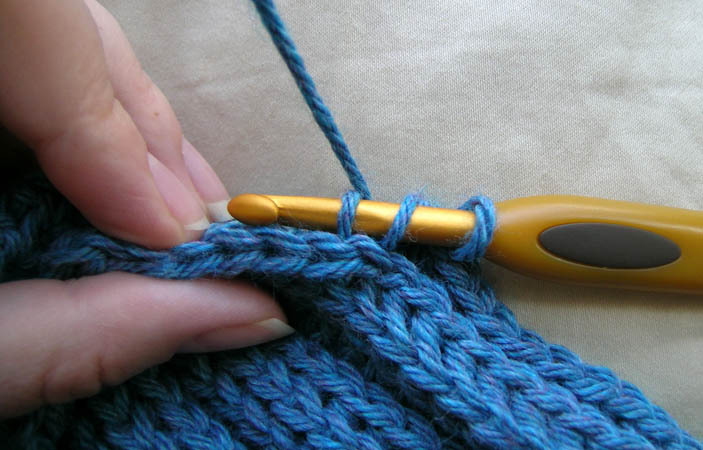 To make the hat smaller or larger than the pattern, you can just add more or less stitches to the foundation row and do more or less repeats of rounds 2-4. FO leaving long tail. 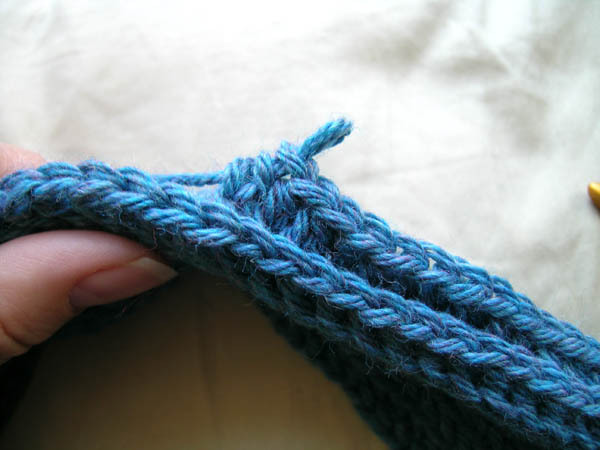 Weave the tail in and out of each stitch of the last round and pull tight to close. Stitch a few stitches to secure and close up opening. 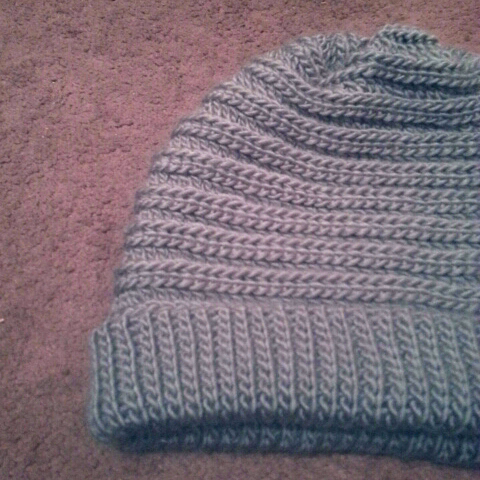 The body of the hat is done. Now for the edging. Upon request, a video of the edging is now available. 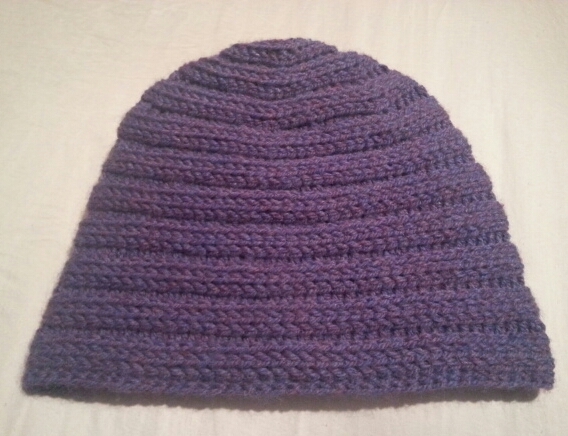 For a Child size hat, Ch 6 instead of 8. Big Worm is a big slouchy version of Worm on a Hook with a rolled up edging, and yes Friday is one of my favorite movies. Big Worm also has a 2 row rib instead of the 3 row rib in Worm on a Hook and more contrast between rows. I apologize in advance for using Slip Stitches for the ribbed edging. After making Doris Chan’s Sash-A belt for my Shannon cardigan a few years ago, I swore of Slip Stitches forever. A few days ago I started Shirley MacDonald’s Dappled Mitts and kept hating the technique, but loved the results. 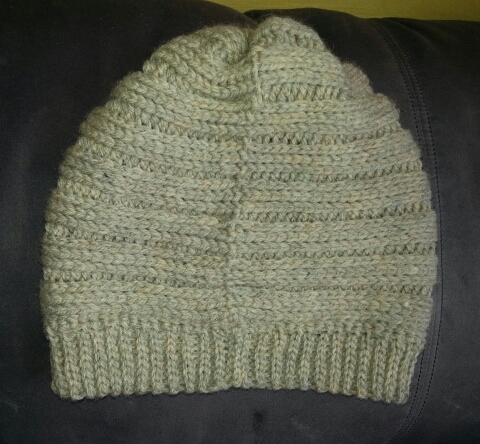 I tried several different types of ribbing for the edging of this hat and hands down the slip stitches worked the best. So… sorry. 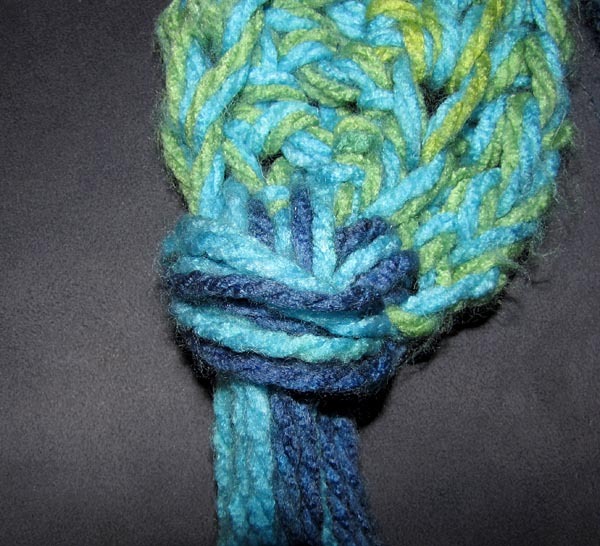 RHDC: Raised Half Double Crochet (special stitch). 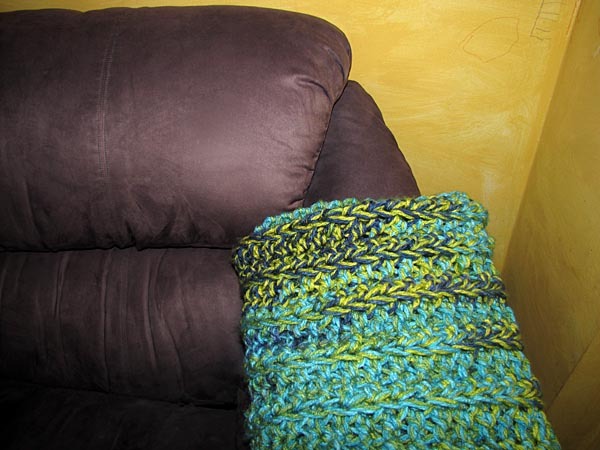 Similar to the Raised Single Crochet (photo tutorial available), but this is the Half Double Crochet version. YO, insert hook from back to front, under top two loops of stitch, then from front to back, under top two loops of next stitch. Hook will be around the post. YO, pull up a loop, YO, pull through all loops on hook. 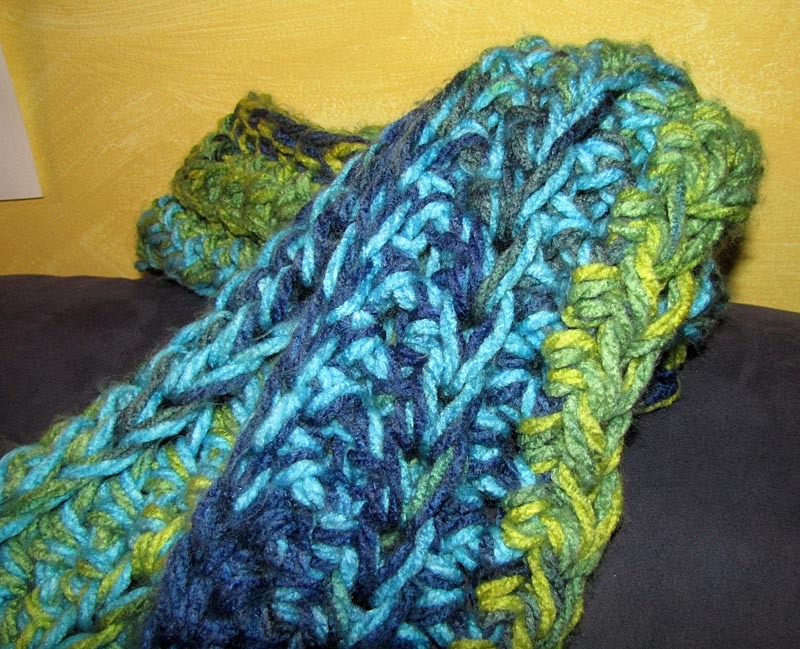 RHDC2TOG: Raised Half Double Crochet 2 Together (special decrease stitch). YO, insert hook from back to front, under top two loops of stitch, then from front to back, under top two loops of next stitch. Hook will be around the post. YO, pull up a loop, YO, insert hook from back to front, under top two loops of stitch, then from front to back, under top two loops of next stitch. Hook will be around the post. YO, pull up a loop,YO, pull through all loops on hook. The body of the hat is worked in the round. You will be joining at the end of each round. Do not turn at the end of the round. First Ch 1 at the beginning of the round does not count as a stitch. Round 21: Ch 1, DC2Tog in BBL around to last stitch, DC in BBL for last stitch. You will be turning at the end of each row. Be sure to count stitches as you go. It is easy to lose stitches if you don’t. Keep your tension VERY loose. 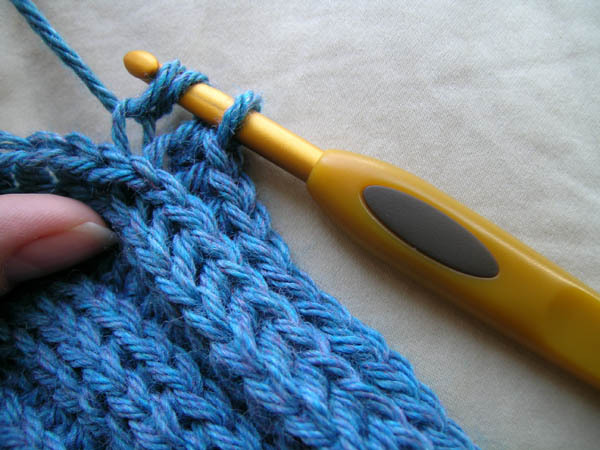 You’ll want to use something to pick up the first and last stitches of each row. It will make life MUCH easier. I used the tip of a mechanical pencil with no lead. You can use the eyehole side of a yarn needle. Repeat Rows 3-8 until you meet up with the beginning, ending with a SS into the foundation row. For the final row that connects the two sides, hold the two right sides together, turn. SS through both sides of work, BLO on side facing you, FLO on other side, FO. It’s been a rough winter. A few weeks ago when the single digit weather started kicking in here in the NY area, I started having flashbacks to my college days in Chicago and as I did back then, I began to pile on the layers. 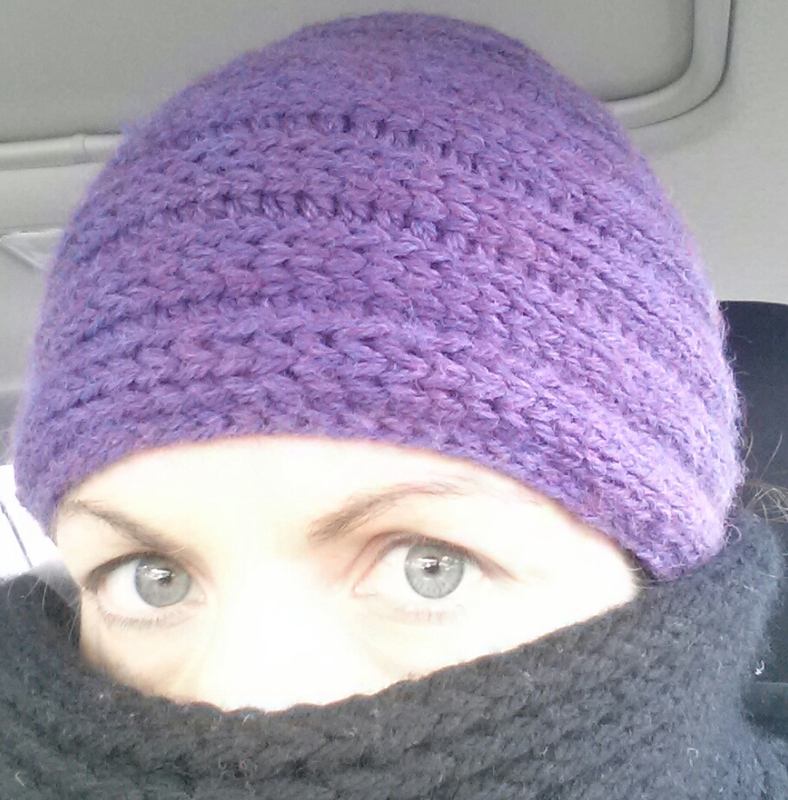 In the search for all the winter gear I could get my hands on, one day I borrowed my husband’s hat. My head had the same revelation my neck had when I started making and wearing scarves a few years ago. It was so warm. I had to have me one of these hats! Looking around at hat patterns, I really liked the super popular knit hat pattern Wurm and thought Sugared Ribs could totally be turned into a Wurm inspired hat. 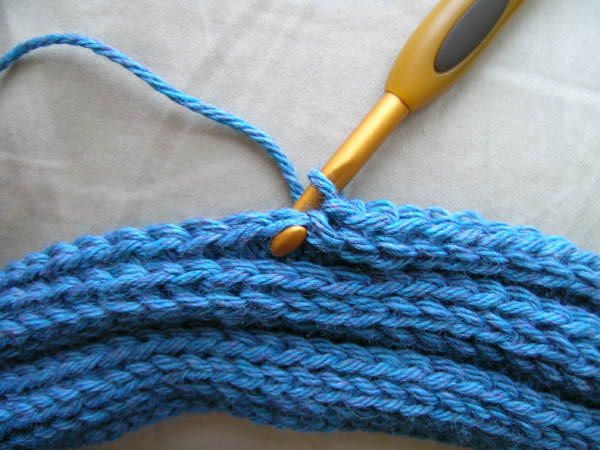 RSC: Raised Single Crochet (special stitch). After using this stitch in the Fritillary Scarf, I did some research to see if there was an official name for this stitch. While I found the stitch mentioned in a few places, I did not see it named anywhere else, so I’ve used the name from the Fritillary Scarf(if it was in American terms). This is similar to a back post stitch. Insert hook from back to front, under top two loops of stitch, then from front to back, under top two loops of next stitch. Hook will be around the post. YO, pull up a loop, YO, pull through both loops on hook. 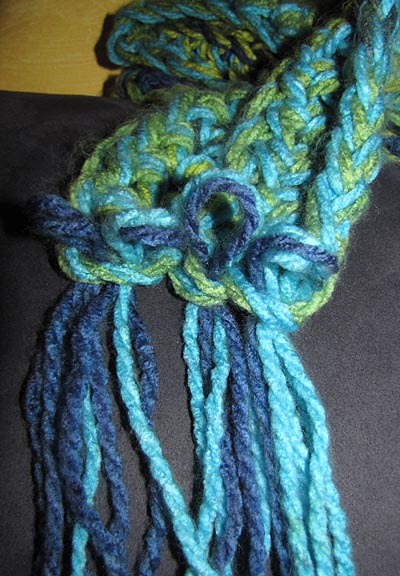 RSC2TOG: Raised Single Crochet 2 Together (special decrease stitch). Insert hook from back to front, under top two loops of stitch, then from front to back, under top two loops of next stitch. Hook will be around the post. YO, pull up a loop, insert hook from back to front, under top two loops of stitch, then from front to back, under top two loops of next stitch. Hook will be around the post. YO, pull up a loop,YO, pull through both loops on hook. This pattern is worked in the round, just keep going at the end of each row. **Confessional side note: I did not have 80 stitches by the time I got to this round. I had lost a few along the way. Count your stitches before you start round 24. If you do not have 80, do HDC2TOG at evenly spaced intervals to get to 72 stitches by the end of the round. Wow, it’s been almost a year since I’ve posted. During that year I’ve been working a lot, still crocheting, and dabbling with the two stick thing (knitting). I recently knit a Brioche Infinity Scarf and while I love the result, I felt like it took forever. To make it go faster, since I was using an acrylic wool blend, I steamed the hell out of it to make it grow, which it did… but it also lost the squishiness that makes the Brioche Infinity Scarf so delicious. I was thinking it was kind of like the ribbed strand of the Hooked Holla Infinity Scarf, but when I tried it out, it was not. This pattern is worked in the round, but you will be turning at the end of each row. 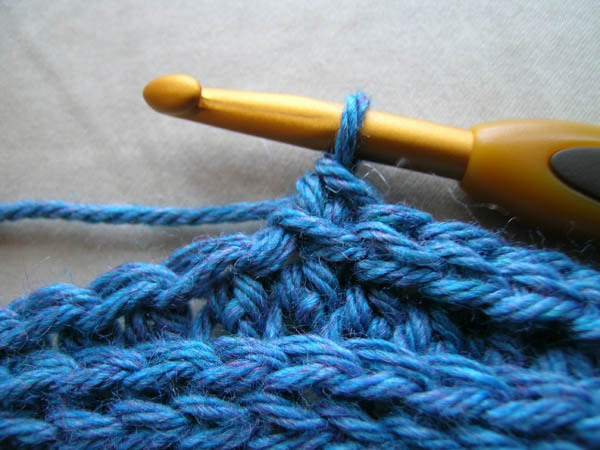 You will be working in post stitches for most of this pattern, but unlike how post stitches are frequently used, you will not be connecting the post stitches. This will result in a much more flexible fabric than you see when you connect the post stitches. Row 1: Ch 2, 179 FHDC, then for final FHDC you will connect the foundation row. Make sure the foundation row is straight, put the two ends side by side, yo, insert hook into top two loops of chain of working side, then insert hook from the back to front of two loops of chain of the other side, yo, pull through both sides and pull up a loop, yo, pull through all loops on hook, connect with SS. 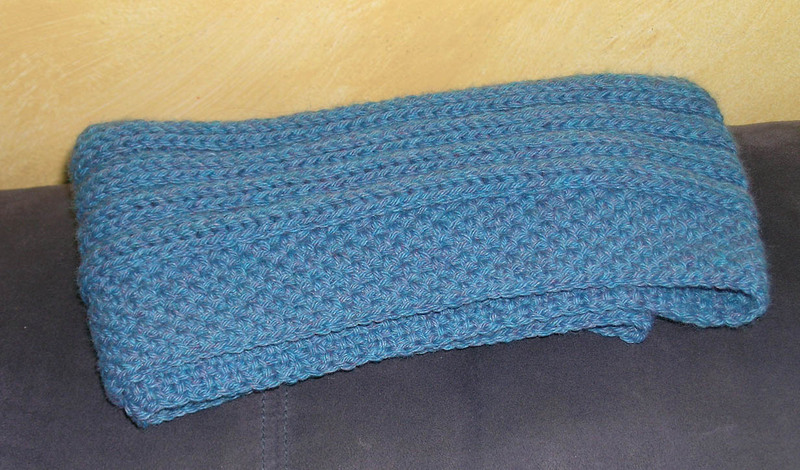 Finished scarf is 54″ long and 6″ wide not blocked. I did not block my scarf because I did not want to lose the squishiness. Longer or shorter scarf: This foundation row is aprox. 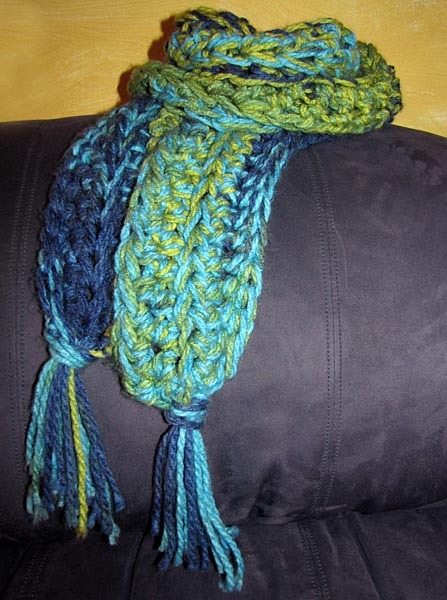 60″ long and will shrink to 54″ in the final scarf. If you want a longer scarf, your foundation row should be 10% longer than your desired finished length. Worsted Weight Yarn: I have also made one in Patons Classic Wool which took around 2.5 skeins (525 yds), using a K hook and did 142 stitches for the foundation row. It was around a 49″ foundation row and I did 32 rows. 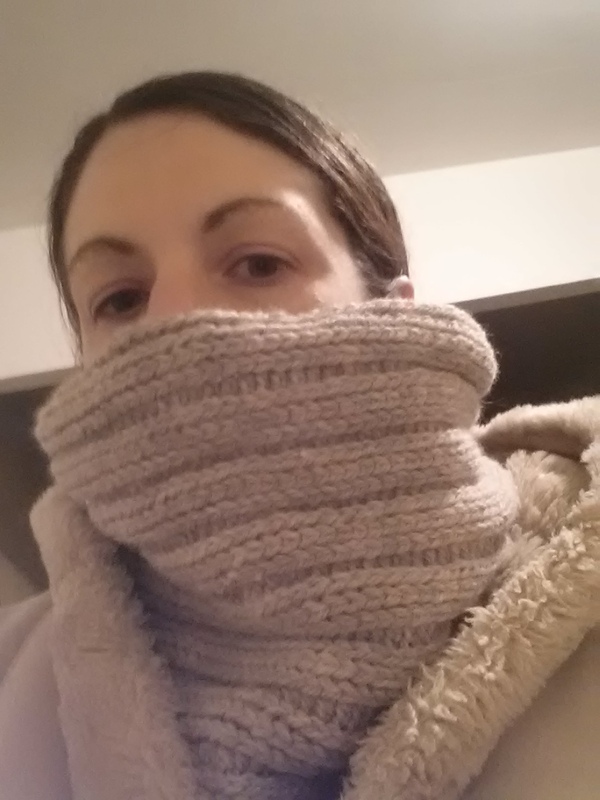 The final scarf was very dense so I steamed and steamed it to open it up. 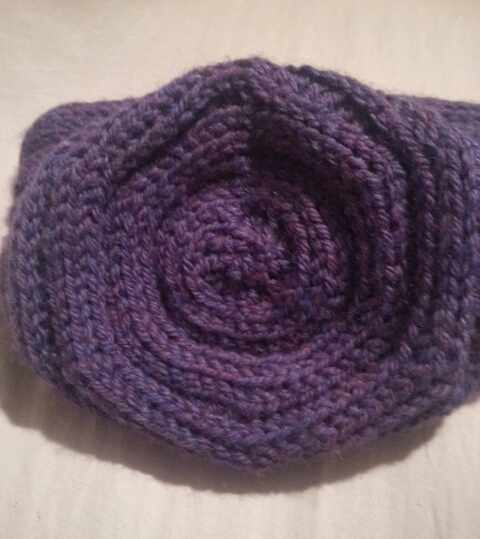 It’s now around the same length and width as the one I made in Cuddle. 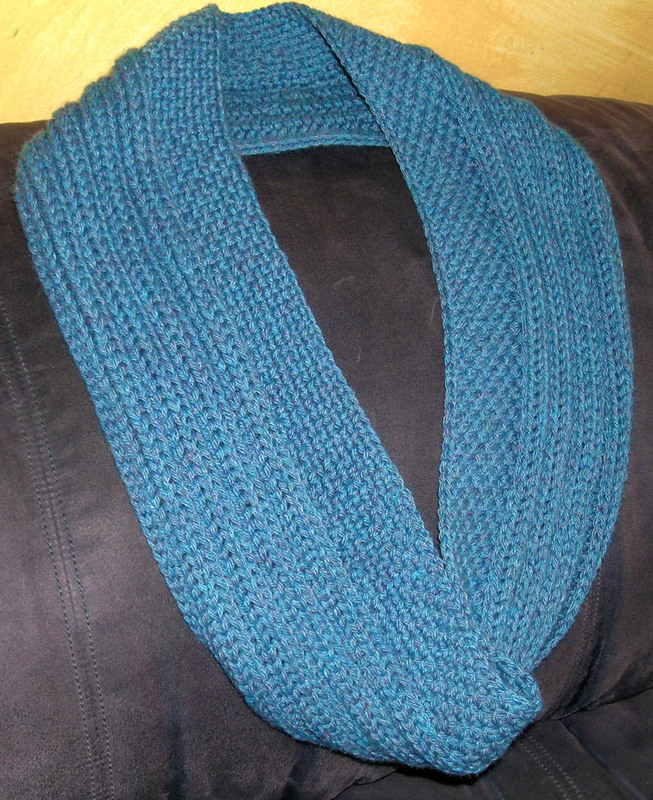 It is a thicker scarf though and the DK weight yarn has more drape. Kid’s Version: I made one for my son in Red Heart Super Saver. He’s been having issues tying his scarf recently and the infinity scarf is easier for him to put on without choking himself. 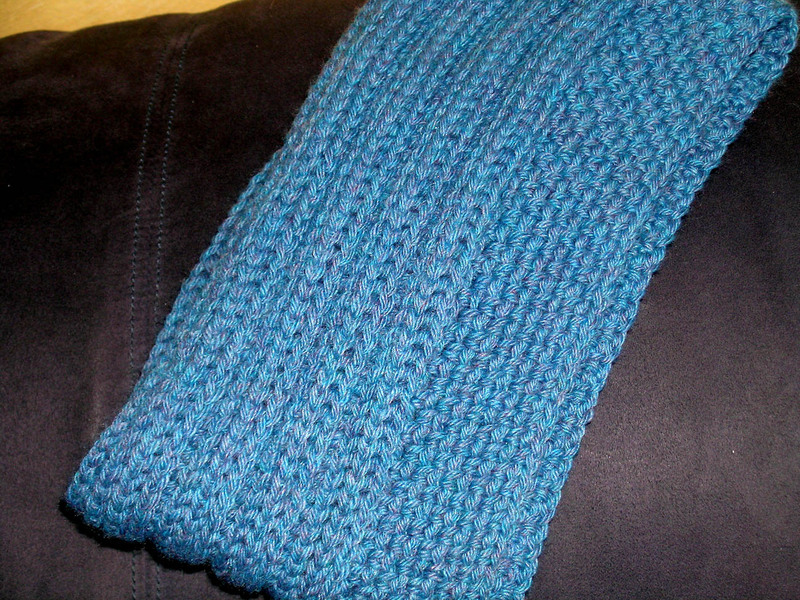 For his scarf I used a K hook, did a foundation row of 140 stitches, 11 rows, and did not block it. 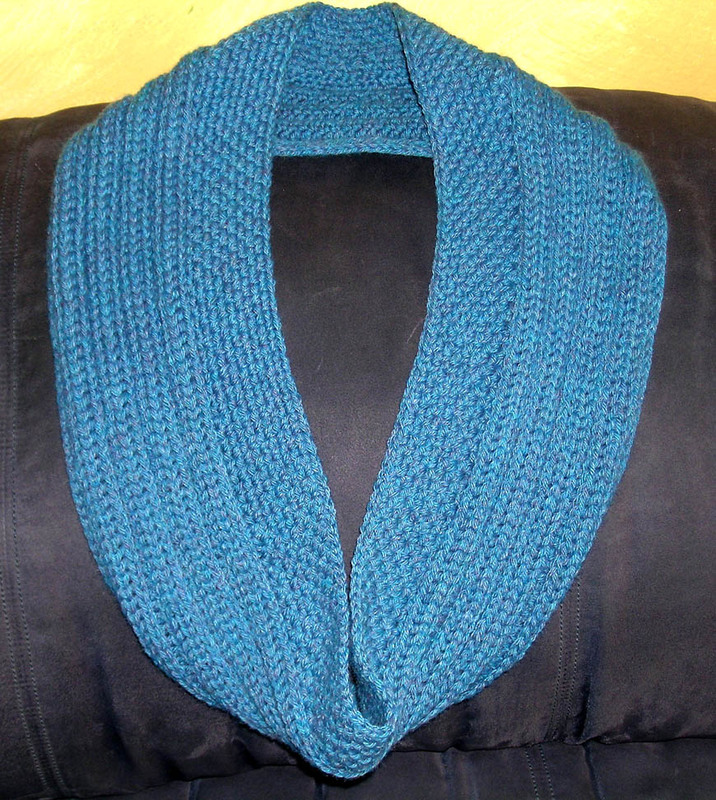 Two Tone: I made my son’s scarf two tone, one side Royal Blue and one side Lighter Blue. I alternated colors on every other row. At the end of the rows I did the join with SS and Ch 1 with both colors before dropping one and starting the next. The seam isn’t spectacular, but it beats weaving in all those ends. 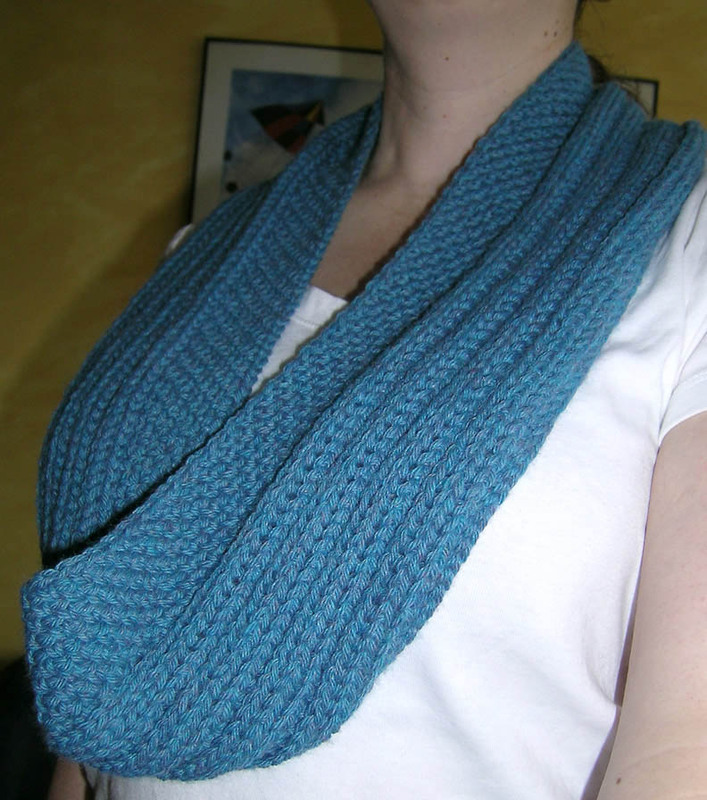 I finally gave Kristen Hein Strohm’s Fritillary Scarf a shot for Christmas presents. Reading through it made no sense, but when I finally sat down to make it, it worked out fine and made a gorgeous infinity scarf. I would highly recommend the pattern from Inside Crochet’s August 2011 issue available through Yudu. 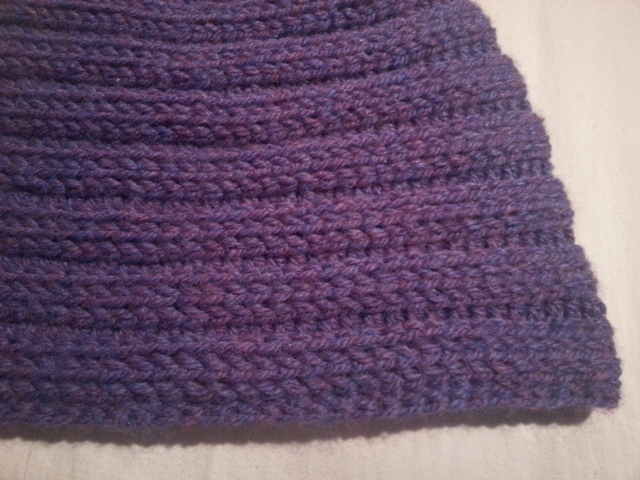 The pattern is for a flat scarf, but works very well in the round. 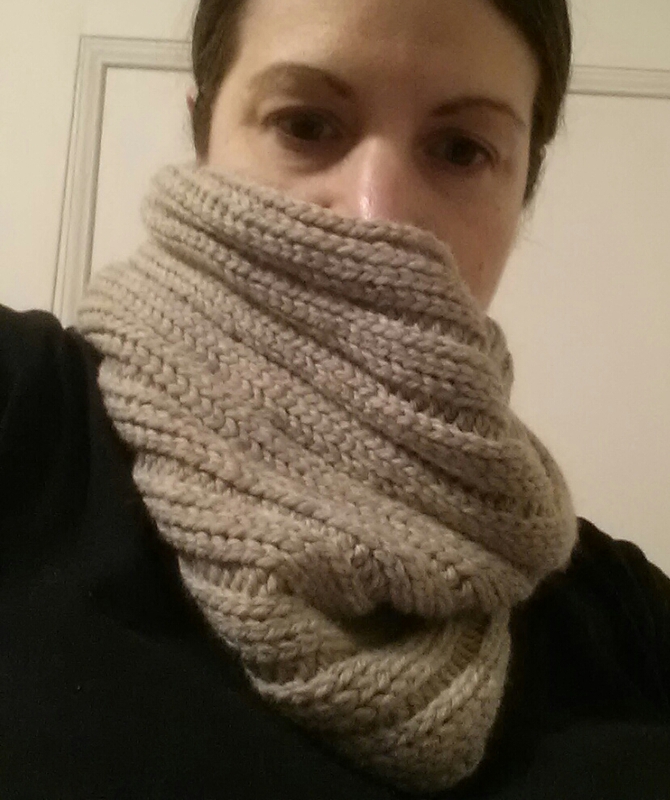 So while I was making these, I kept thinking how great it would work as just a ribbed cowl. New Year’s Eve I kept playing around with stitches and stitch patterns and while I wasn’t convinced just a ribbed cowl was the way to go, by New Year’s Day, my new infinity scarf Sugared Ribs was complete and I totally love how it came out. Sugared Ribs starts off with 4 shallow ribs (or faux ribs depending on your point of view), then ends with a few rows of seed stitch. I love ribbing and am always up to try a new crochet method. 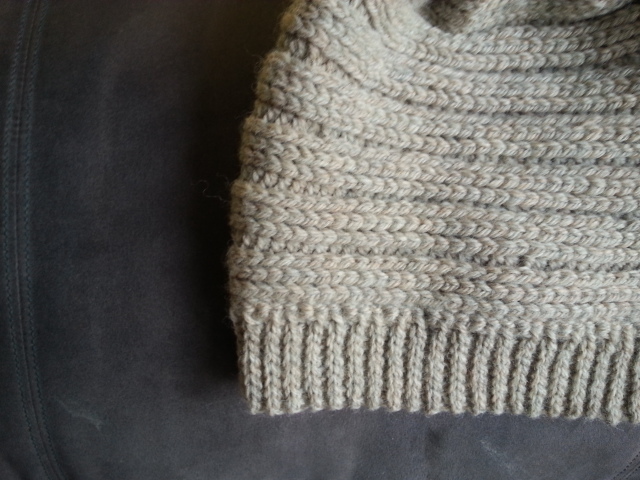 I really like how this ribbing came out. The rib rows take a while, but you’ll sprint through the final rows of seed stitch and the combo works great together. Only want the ribs (aka Sugar Free Ribs)? Repeat rows 2-4 until it’s as wide as you want it. you may want to end with a row of SS or SC. 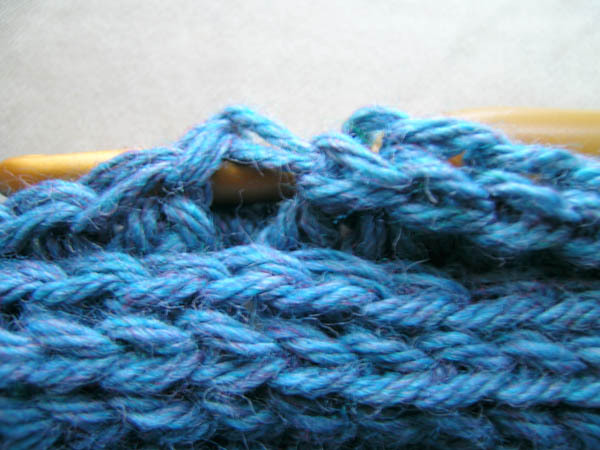 This length is long enough to double, but you can make it shorter or longer, just use an odd number of stitches. As soon as I finished making the Supersized See My Stitches Scarf, I knew I wanted a blanket just like it. So bright, soft, and squishy, I just wanted to wrap myself inside. Last week with Charisma on sale yet again for $2.50/skein, I seized the opportunity and bought up all the Sunny Day I could get my hands on. Saturday morning my son woke up around 6AM, which means I was up too. I started the blanket after my morning coffee and by mid afternoon, my blanket was done! Based on the very simple pattern of the Supersized See My Stitches Scarf, but as a blanket, here’s how to make the See My Stitches Color Party Throw. Final size is 44″ x 64″. You will be working this blanket from side to side. 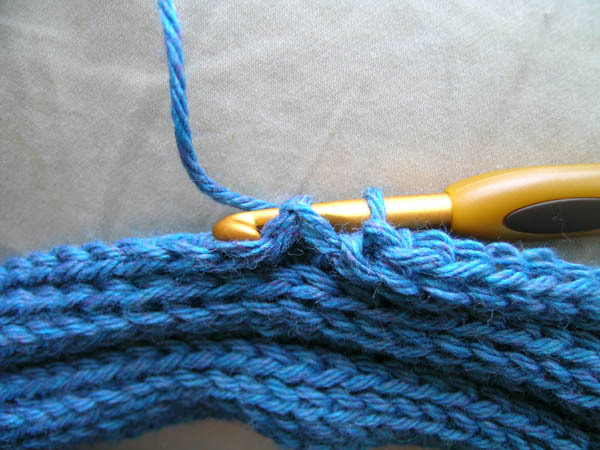 Hold 2 strands of yarn together throughout the pattern, except for the border. Start using the 19mm hook. Border: Work the border on the top and bottom of the blanket. It will be in the side of the stitches. 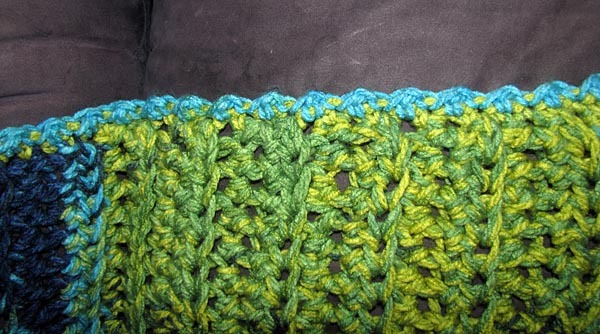 You will be working with only 1 strand of yarn for the border and will use a 10mm hook. You will be working through both loops for the border rows. **After trying several different border designs that didn’t work, I found this simple one through the Crochet Pattern Central website. It’s from The Sunroom and properly named Easiest Ever Crochet Edging. It works perfectly to finish off this blanket. Finish Off and weave in ends. Use a little glue in a hidden location if needed. This will help keep the ends woven in since the yarn is so big and the stitches are huge, sometimes the yarn likes to come out. The glue will keep it from doing that. Mary Jane Hall talks about this tip on the Positively Crochet! blog. 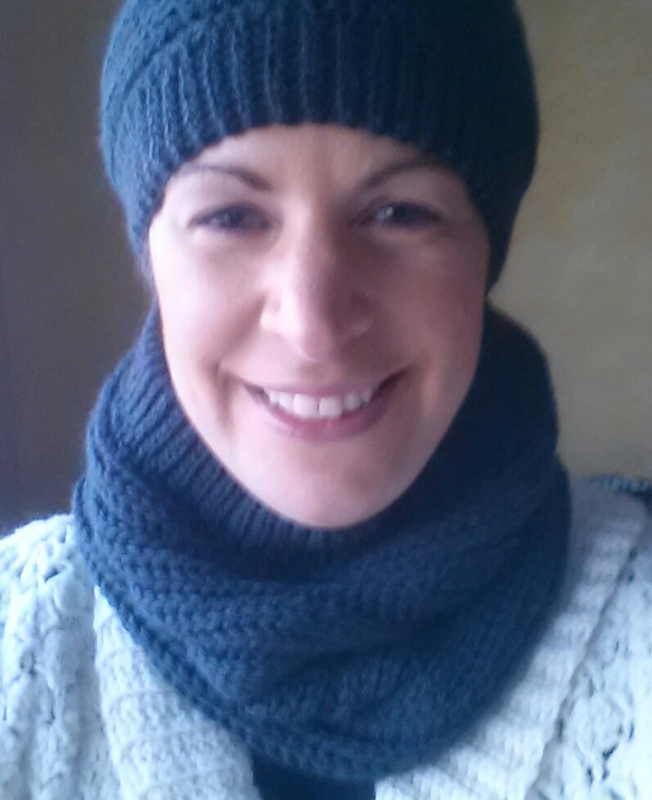 One of the first patterns I favorited on Ravelry was Lorraine Hern’s Bionic Wrap Scarf (pattern available on Ravelry and My PDF Patterns). 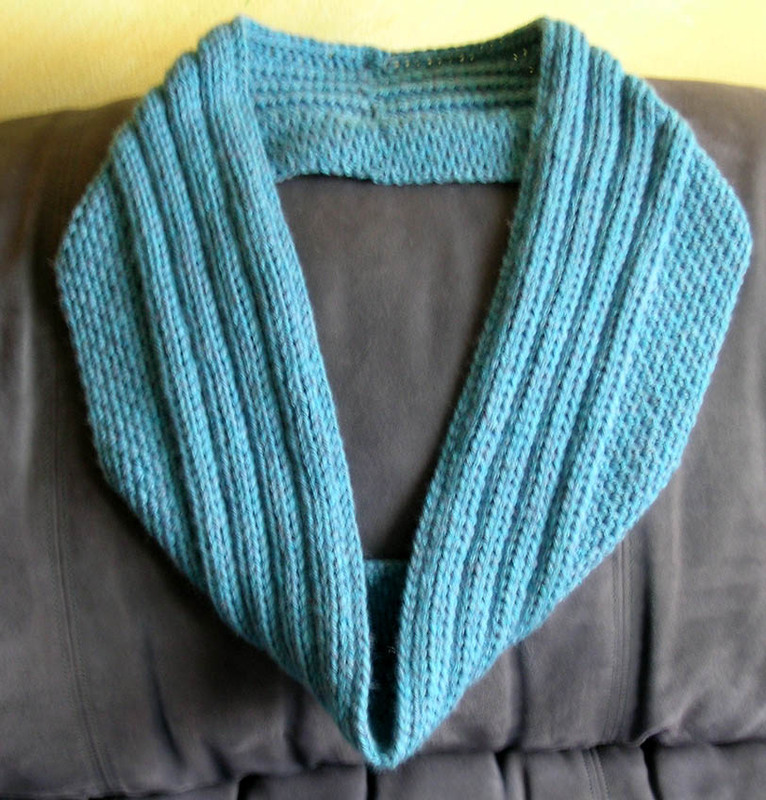 Well… when I was about to pay for the pattern, I realized you needed two needles and not a hook to make this scarf. It was a knit pattern, so much for that idea. Over the months, I’ve continued to love the oversized stitch look and have been drawn back to this scarf time and time again. The Bionic Wrap Scarf was the inspiration behind my crocheted Supersized See My Stitches Scarf which I had a blast making and LOVE wearing. 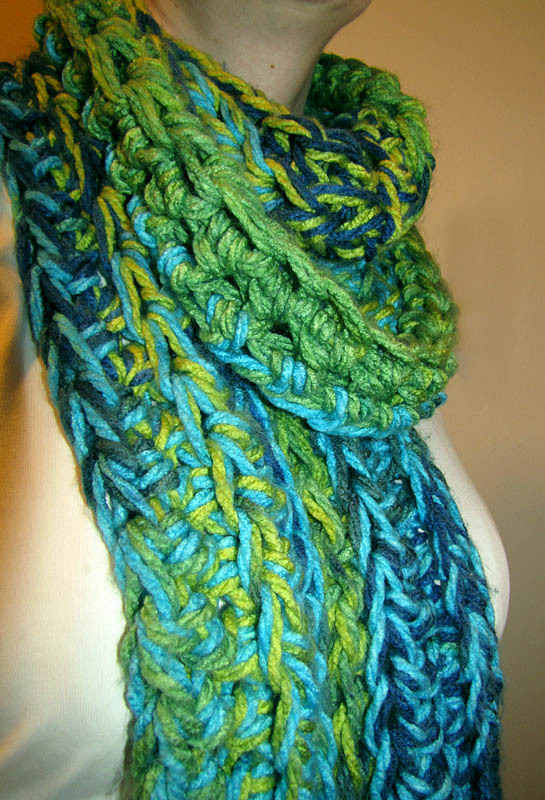 I have decided this is my favorite scarf and I want to make a zillion more. It’s very simple and a lot of fun. 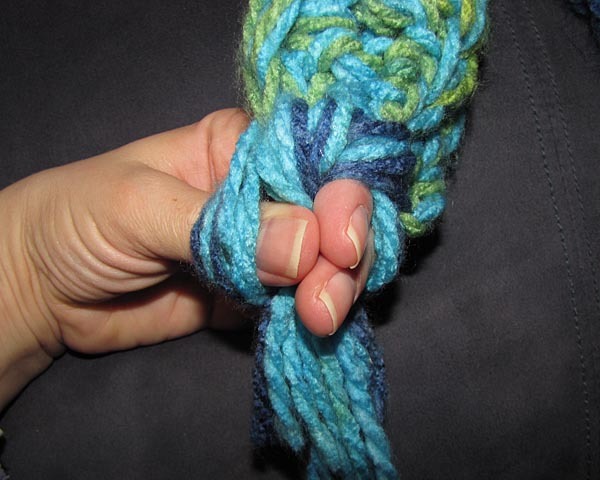 Hold 2 strands of yarn together throughout the entire pattern. Leave a 6.5″-7″ tail when starting, this will become part of the fringe. Finish off leaving a 6.5″-7″ tail. 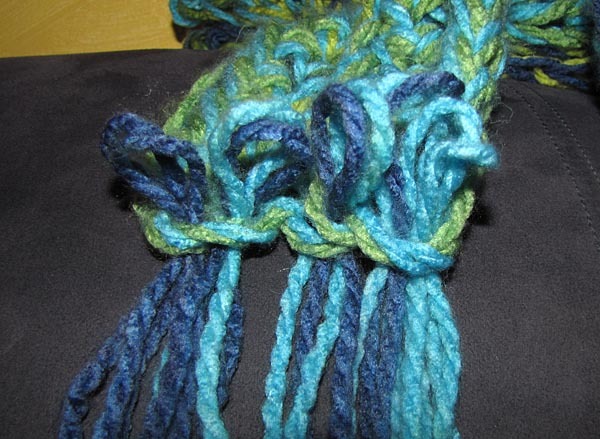 Incorporate starting and ending ends of the scarf into the fringe so you don’t have to weave them in. Thread 4 sets of 2 strands on the side with the ends and 5 sets of 2 strands on the other end of the scarf, push the loop in, then bring all the loops together and pull all the ends through at one time so it makes one big knot and one big fringe on each end. Uses EXACTLY all the yarn. It’s a party of color.